Blondie and Brownie: A Doughnut Muffin! Brillant! Ginger and I wanted some comfort food, preferably macaroni and cheese, for our Tuesday lunch. She choose Dishes, and we headed on into Grand Central Terminal and down to the Dining Concourse for some. We didn't find Mac & Cheese-that's upstairs in the market-but I did find the most perfectest breakfast item ever. 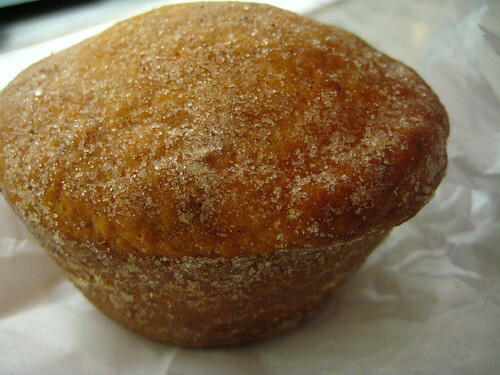 An old-fashioned doughnut MUFFIN. I first heard about this crazy talk last year after reading this Serious Eats article, but no one told me that I can get one in New York. The very fact that this hasn't become the new cupcake is ridiculous. The muffin itself was good for a late afternoon breakfast snack, probably better closer to getting out of the oven. 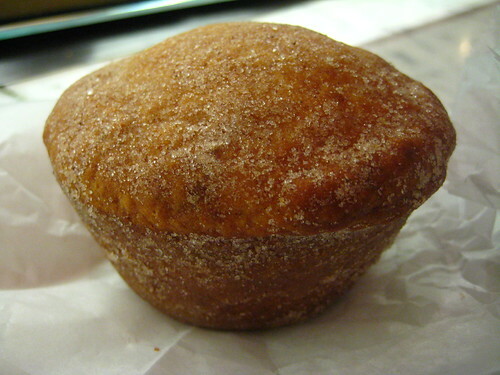 The inside was more muffin than cake, the texture reminded me of a corn muffin, very crumbly. The outside was dusted with sugar, and reminded us exactly of a doughnut. I think I now know our mutual breakfast treat.